This rumpled bit of fabric is about to become something great. I can almost taste it. 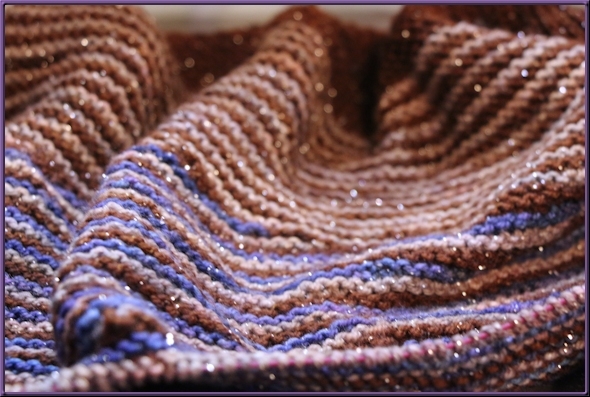 This, of course, is my long-suffering Color Affection shawl, which I know we have all been staring at on this blog for months now. Are you sick of it yet? I am. There. I said it.The good news? I’m nearly done with the eighth repeat of the short row section, which is the last one before the bottom border, as the pattern is written. Mine is so narrow from top to bottom, though, that I think I am going to eek out just one more repeat before I call the section done. As to the bottom border, I am considering doing a narrow band of the grey before doing a wide band of the blue. Anything to add to the overall top-to-bottom length. I had a lovely potluck lunch and yarn swap with the ladies from knit group today. For me, this is the best part of my knitting hobby. Sure, knitting itself is a mostly solitary activity, but because of it I have met so many wonderful people that I can honestly say are now my good friends.